The Stork Club delivered. Founded in 1929, it gave New Yorkers a classy place to eat and imbibe – away from the prying eyes of Prohibition enforcers. And its namesake drink made the cloak-and-dagger worth it. 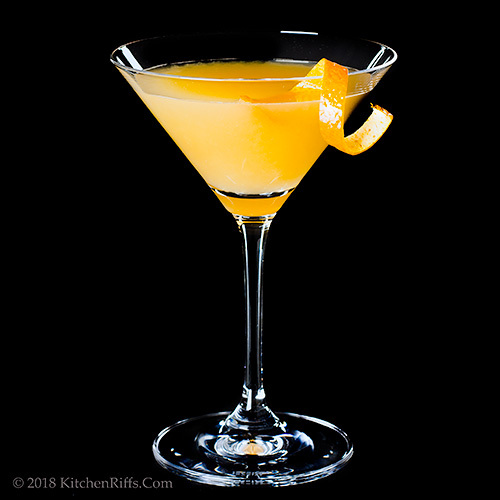 A smooth combo of gin, Cointreau, and citrus juice, the Stork Club Cocktail offers the perfect start to your night on the town. No password needed. Gin has always been a popular cocktail ingredient, but during Prohibition it became the spirit of choice (or at least convenience). That’s because gin, unlike bourbon or rye, doesn’t require aging. So a bootlegger could produce a batch one day, and sell it to a barkeep the next. Place all ingredients (except garnish) in a cocktail shaker half-filled with ice. Shake vigorously until the contents are well-chilled (about 20 seconds). Strain into a cocktail glass, preferably one that has been chilled. 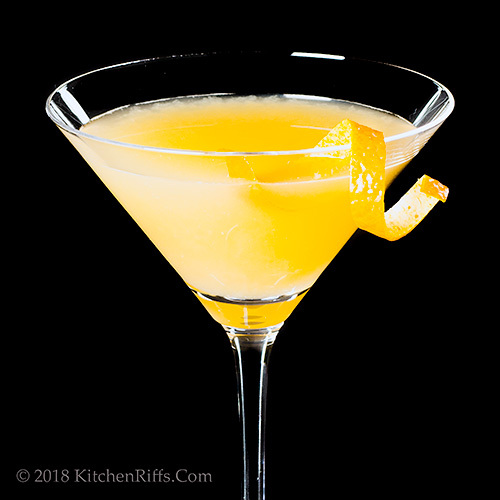 Add an orange twist for garnish, if desired, and serve. We like to use a full ounce of orange juice in this drink. But if that makes it too sweet for you, try ¾ ounce. 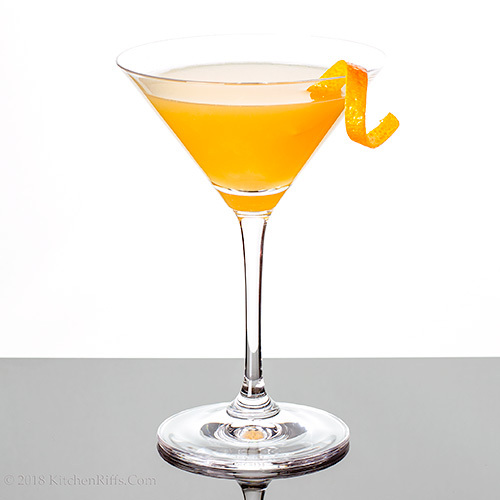 Some recipes substitute Grand Marnier for Cointreau, which also makes the drink slightly less sweet. But a triple sec like Cointreau was the original ingredient. Fresh-squeezed OJ makes the best-tasting drink, though in a pinch you can use bottled. But there is no substitute for fresh-squeezed lime juice. The Stork Club was founded in 1929 by Sherman Billingsley, a bootlegger from Oklahoma. Billingsley had previously resided in Leavenworth prison for a time. The original Stork Club was located on West 58th Street in Manhattan. After it was raided by Prohibition agents in 1931, Billingsley moved it to East 51st Street. In 1934 the club moved again, to 3 East 53rd Street (just off 5th Avenue), where it remained until it closed in 1965. The building that housed The Stork Club no longer exists. 3 East 53rd is now home to Paley Park, a small public space in Manhattan. From the beginning, celebrities flocked (so to speak) to The Stork Club. Ernest Hemingway drank there (but of course Hemingway drank everywhere). Other luminaries included Damon Runyon, H.L. Mencken, Fred Astaire, Ethel Merman, Lucille Ball, Grace Kelly, Frank Sinatra, Marilyn Monroe, Elizabeth Taylor, and Walter Winchell. The Duke and Duchess of Windsor, John F. Kennedy, and J. Edgar Hoover also showed their faces. The Stork Club was a place where people went to be seen. But the food and drink were pretty good, which helped ensure that it remained popular. The club had one of the best bar scenes in New York at that time, with many popular drinks being devised by its head bartender, Nathanial “Cookie” Cook. But the namesake Stork Club Cocktail was actually invented by Eddie Whittmer, a captain of the waitstaff. “So Sherman Billingsley’s club made quite a splash back in the day,” said Mrs. Kitchen Riffs. “At one point, Billingsley was even kidnapped by a rival mobster named Mad Dog Coll,” said Mrs K R.
“I’m trying to imagine Ward and June Cleaver as bootleggers,” said Mrs K R.
“Eddie Haskell would have made a great bagman,” I said. And Ward would finally have had a real job. Love your history of this iconic drinking institution! Hi Mae, Happy New Year! The Stork Club was so much fun to read about! The drink, too. :-) Thanks for the comment. Hi Karen, we obviously like the taste of cocktails, but it's really their history that interests us the most! Thanks for the comment. What a beauty! That lemon rind garnish looks perfect. Oh my ... this one has my name written all over it! Looking forward to trying it soon. Hi Pam, it's good stuff. :-) Thanks for the comment. Hi Jean, it's a good drink -- really interesting flavor. Thanks for the comment. bootlegs and mobsters, what a history behind the bar. Did not know gin was not aged. But the cocktail has aged well, sounds fab. And Happy New Year to you and Mrs K R! Hi Evelyne, this drink (well, the establishment it's named after, really) has a particularly fascinating history. Thanks for the comment, and Happy New Year! Very interesting gin facts! Anything with citrus gets my attention, especially now that the new crop of oranges, lemons and limes have arrived at the market! Hi Deb, citrus is so good in drinks, isn't it? And lovely in this! Thanks for the comment. Fascinating! And this is a cocktail I might really enjoy! Hi Mimi, cocktail history is fun, huh? :-) Thanks for the comment. I wish I could've visited The Stork., At least I can have this delicious drink! Hi Jeff, the Stork sounds like a swell place! This drink sure is swell. :-) Thanks for the comment. This sounds so tasty! It looks like a summertime drink, something I"m craving right now with our subzero temps. Hi Vicki, this would be a good summer drink! Perfect for our friends down under. :-) Thanks for the comment. I love all the history on the Stork Club, it's fascinating. Happy New Year and cheers!! Yes, I can still remember Eddie Haskell buttering up the Beaver's mother by saying, "You look lovely today Mrs Cleaver." This drink has some of the same ingredients of a Margarita- lime juice and triple sec (Cointreau), but I'd have to substitute the gin for the tequila. Happy New Year! So hot and humid here in North Queensland - this looks perfectly refreshing! Plus there's a heap of limes weighing down my tree at the moment. Happy New Year! Although I do not consume cocktails but the history lessons you give are so interesting. And the photos too :). Hi Dahn, isn't the history fun? Love it! Love the drink, too. :-) Thanks for the comment. Hi Fran, this IS somewhat similar to a Margarita. Good drink. And that Eddie Haskell -- what a character! :-) Thanks for the comment, and Happy New Year! Hi Marcellina, we used to have a lime tree when we lived in Florida -- loved it! And this is the perfect drink for your weather. :-) Thanks for the comment, and Happy New Year! Hi Amira, cocktails are pretty (usually) so they're fun to photograph. And the history is neat, isn't it? Thanks for the comment. Just bought a bottle of Hendrick's gin. Would it work for this? If so, I have everything so I can make this my weekend cocktail this weekend. Love gin and love the orange flavors. Great little cocktail John. Thanks! And a Happy 2018 to you and Ms KR! Hi MJ, it'd be fun to try Hendrick's in this drink -- I think its flavor would be rather interesting. Enjoy! Thanks for the comment, and Happy New Year! Sounds delicious and I love the history. Thank you for your efforts. I live alone and cannot drink too much but I like to some and your drinks sound so delicious. Can you suggest ways in which I might adapt your drinks with perhaps more mixer or something. Maybe precombining the other ingredients and perhaps adding less alcohol? Anything advice you can think of would be great. Doesn't get more glamorous than this. I would love to give it a try. Lovely drink and it looks perfect! Happy New Year! Hi Marion, adding more mixer will throw the balance of the drink off. If you want to make a smaller drink, I'd suggest just reducing all ingredients by about half. You can't really reduce 1 dash of bitters by half, but that's OK -- just add that 1 dash. Hope that helps! And thanks for the comment. Hi Angie, thanks for the comment, and Happy New Year! Hi Amalia, this is such a nice drink! Thanks for the comment. Hi Amy, it really is lovely! Terrific flavor. :-) Thanks for the comment. Fascinating history on this drink. While I don't love gin, I bet I would love this beautiful cocktail. Happy New Year! Hi Tricia, cocktail history is fascinating, isn't it? As are the drinks themselves. :-) Thanks for the comment, and Happy New Year! I love the bright color of this - just what we need to combat the frigid weather! Hi Laura, it really is cold out, isn't it? This will help us forget! Thanks for the comment. Hi Peachy, looks good,tastes better! :-) Thanks for the comment. It wa interesting to read about the Stork Club. This drink sounds wonderful! Happy New Year! Hi Dawn, it IS wonderful! :-) Thanks for the comment, and Happy New Year! Hi Merryn, this is a great drink for you at the moment! Help chill that heat wave. :-) Thanks for the comment. Hi Bobbi, didn't think of this as a health drink, but you're right. :D Thanks for the comment, and Happy New Year! This may be the first drink I have after I have the baby! Looks delicious and so tempting right now! Maybe I can figure out how to make it non-alcoholic. Ha,ha. Love this simple drink! 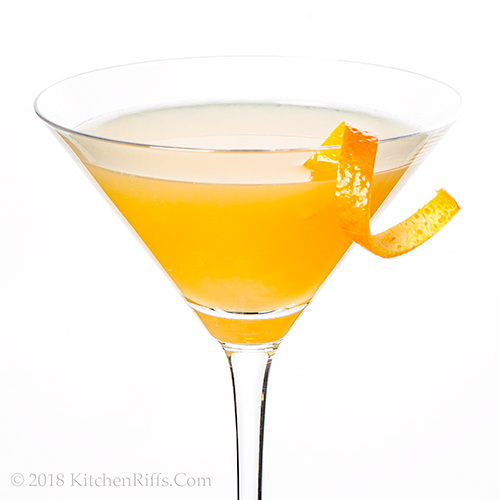 This one is perfect this time of year with the citrus in it. CHEERS!!! Hi Ashley, this is definitely a great first-drink-after-baby treat. :-) Thanks for the comment. Hi Pamela, citrus tastes so good right now! As does this drink. :-) Thanks for the comment. Hi Debra, yup! :-) Thanks for the comment. LOVE LOVE LOVE IT!! I love this era of NYC history and love that I can have a literal taste of it now!! Hi Jessie, isn't it fun to drink history? :-) Thanks for the comment. That is so interesting about why gin became popular with Prohibition. I've always loved it. I know its botanical taste can be off-putting to some. But once you start to like it, it's a love affair for the ages. Hi Carolyn, we really like gin too, for the same reason. Really didn't years ago, but it grows on you. :-) Thanks for the comment. Hi Greg, it does sound like such an interesting place, doesn't it? :-)Thanks for the comment. Interesting! Great recipe. We have a bottle of Old Tom! Hi Liz, we have a bottle of Old Tom, too! :-) Thanks for the comment. What a beautiful way to start the New Year! Hope you had a happy Christmas and I wish you all the best for a happy and healthy new year! Hi Agness, you will! :-) Thanks for the comment. Hi Eva, isn't this nice? We had a terrific Christmas! Thanks for the comment, and Happy New Year! If there is one appropriate time to celebrate with a cocktail well, this is New Year! Happy New Year to you! Hi Katerina, totally agree! :-) Thanks for the comment, and Happy New Year! Hi Emma, it's a really good drink -- such a nice flavor. And it looks so cheerful! Thanks for the comment.